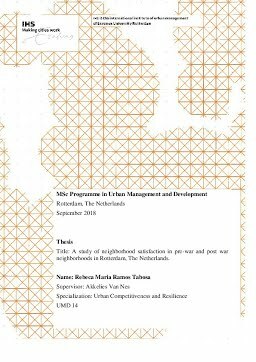 Erasmus University Thesis Repository: A study of neighborhood satisfaction in pre-war and post war neighborhoods in Rotterdam, The Netherlands. A study of neighborhood satisfaction in pre-war and post war neighborhoods in Rotterdam, The Netherlands. Nowadays, quality of urban life is an important concept to urban living environments. Satisfaction with the live in the neighborhood is seen to be a meaningful subset of this concept. This research approaches the theme of neighborhood satisfaction in pre-war and post-war neighborhoods in the city of Rotterdam, the Netherlands. The typology of pre-war and postwar urban areas are assumed to provoke differences in satisfaction. Therefore, this research aims to explain the extent to which neighborhood factors (physical, social and safety) and selected spatial features of the urban environment can influence the level of neighborhood satisfaction in these two types of neighborhood. For that matters, data from the Wijkprofiel Rotterdam (2018) was used to get information regarding neighbourhood satisfaction as well as physical, social and safety measures. The data from spatial features, which include micro and macro scale measures were taken from the database of Google maps and Akkelies Van Nes (2003), respectively. Micro scale included the degree of inter-visibility of windows and entrances while macro scale referred to measures of metrical and angular analysis through the use of Space Syntax. Together with neighbourhood factors and selected spatial features (independent variables) a beta regression was performed, with dependent variable being neighbourhood satisfaction. The result of the statistical analysis reflects distinctive relationships between these variables in pre-war and post war neighbourhoods, as analysed separately. The results indicated that there is a significant relationship and a difference to the extent in which both neighborhood factors and spatial features influence neighborhood satisfaction in pre-war and post war neighborhoods. In addition, a few spatial features were also seen to differently influence neighborhood factors in these two types of neighborhoods studied. The research further observed significant effects from the control variable of average income.